Moved the car from parents to my place, now i have my hoist its back on track. 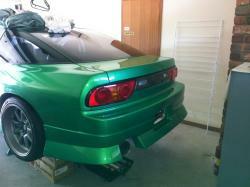 Cant wait to finish this car, once my shed is build its happening!!! Yes the fuel is cooled on the return line, your fuel system is a circulating systems so what ever hot fuel from the engine bay isn't used is returned back to your tank, therefore you want to cool the fuel down as much as possible before it mixes with the cool fuel still in the tank. The cooler the fuel the more power your are going to make, hence why people use methanol as its such a cold liquid already. But when running pump 98 when im not running e85 i want the cooler in place to have the advantage of running cooler fuel all of the time. The fuel is also heated up when being forced through multiple fuel pumps so anything you can do to reduce the heat is a win.